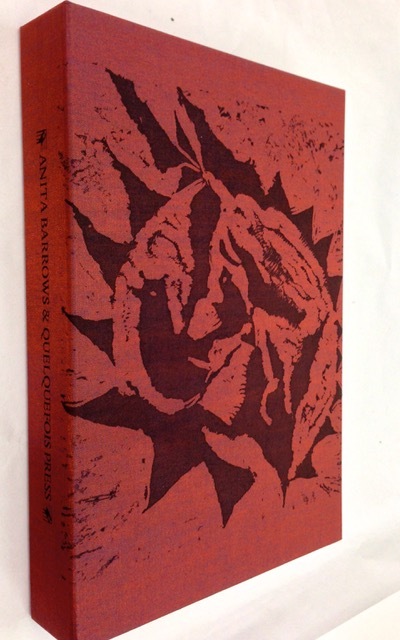 An elegant drop spine box, housing two powerful books by Berkeley poet, Anita Barrows! Left tray lined with sand-colored micro-suede, mirrored by jet-black micro-suede on the right which has a small step built in to accommodate the quarter inch difference in book widths. 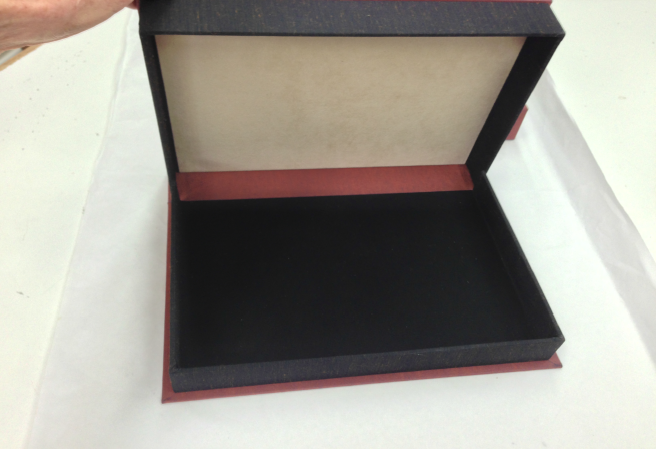 Outsides of trays are covered with Japanese black silk with mohair sand-colored inclusions. Finished box measures 10 & 7/8 x 7 3/8 x 1 & 1/8 inches. 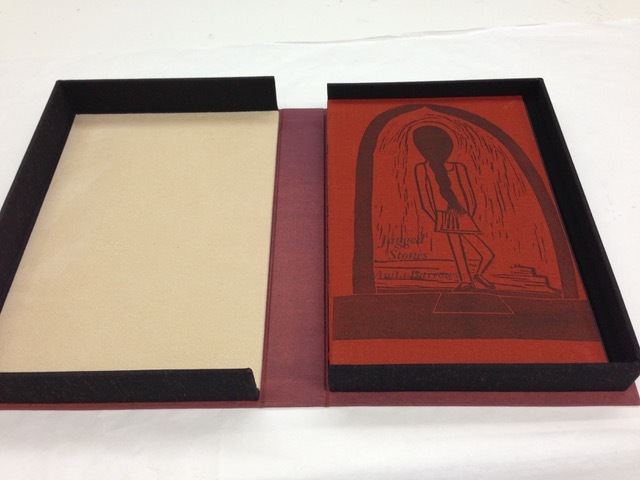 Thirty boxes of Japanese burnt red cloth with black shimmer, overprinted with Anita Barrows’ linoleum cut. 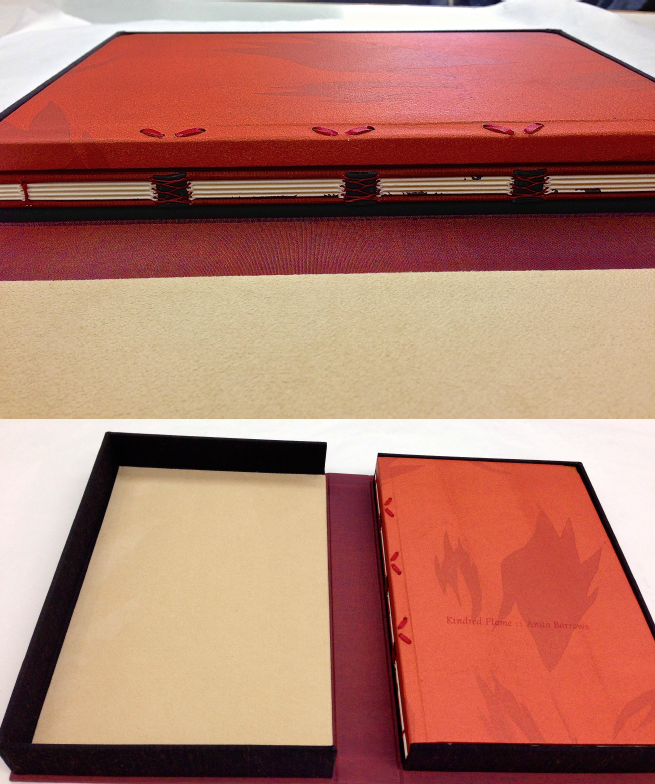 Names are letterpress printed on spine. 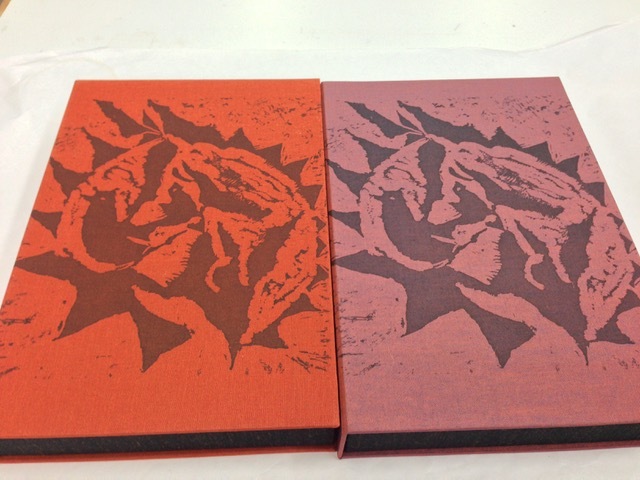 Twenty-five boxes of burnt red Brillianta cloth, same cloth as cover of Jagged Stones. 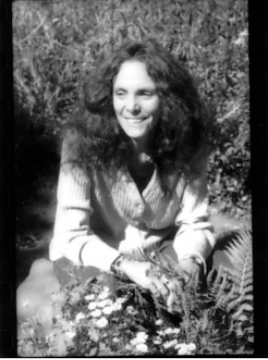 Anita Barrows, May’s Poet for Peace, a clinical psychologist with a private practice specializing in autistic children, after years of teaching and translating from German, French and Italian, feels obliged in her poems, even though her materials be the most commonplace, “to probe that territory for which form and discipline form the vehicle but that contains something else, transcendent.” Her two occupations happily collaborate in her poems. And her two daughters and granddaughter heighten her sense of the immediate, the political, even as her practice in Theravadan Buddhism has helped to center her life and work. She is the recipient of a National Endowment for the Arts grant, a Quarterly Review of Literature award, a Riverstone Press award, a runner-up for a PEN Translation Award for Rilke’s Book of Hours with Joanna Macy, and many others. A Year with Rilke, edited by Anita and Joanna came out in 2010, She lives and works in Berkeley.